Mediator Pattern: The objects are interested to interact with many other objects, so the relation is many to many. Colleagues: These objects are primarily the targets that will not talk to each other directly and have the same base type abstract class or interface that will inherit the same attributes. Furthermore, they will have have the knowledge of the mediator component, which means that each of them will have access an instance to the mediator pattern, rather than having instances to other colleague objects. 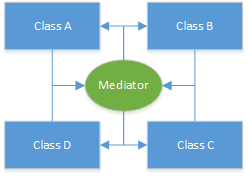 Mediator: The centralized component that manages the communication between colleague components. To better understand the concept, I have developed a simple HR Organization suite. Here the HR is the mediator that knows all the participant Organization units and handles the communication between the Organization components. 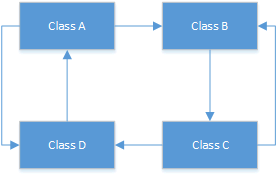 Then last of all we have the Organization base type that has all the common attributes, Manager and Employee objects are the child classes for the organization, they are separated and have their own functions. The communication is eliminated. Surprise Party Preparation: After the resignation process is approved by the manager, the HR throws a surprise party without notifying the resigning employee and makes an announcement to the whole Organization. Spring’s MVC Pattern makes use in the Dispatcher Servlet where mediator handles all the web requests as well as the controller objects.